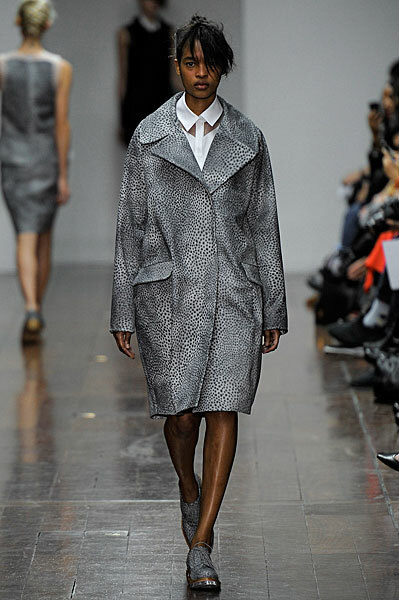 LONDON FASHION WEEK AW12: SIMONE ROCHA - A STAR IS BORN? Forgive me for that question mark. I am not one to take leave of my senses and start pronouncing a young designer a star on her first official outing as part of the NEWGEN programme at London Fashion Week. However judging by the concise, creative and inspiring outing from the Irish designer Simone Rocha this morning, I couldn't resist the question itself. As as group of us bustled backstage to congratulate Simone following her show this morning, I overheard buyers from influential London store Dover Street Market saying: "That was good". "No, that wasn't just good, that was magic." I am inclined to agree. It is not easy to follow in the footsteps of a famous father, but St Martins MA graduate Simone Rocha has done just that. In case you haven't made the connection yet, her Dad is John Rocha. From sweet collars, child-like shift dresses, and knitted tiaras to chunky brogues with thick wooden soles sandwiching glinting strips of neon, and oversized coats, this collection was a sweet boy/girl clash. "It was inspired by Ireland," Simone told me post show, between being congratulated and all round mobbed by well wishers. "It started after I found images of a feral tribe from Papua New Guinea called 'New Ireland' - thats where the densely tufted wools, wild mohair and animal print grey fabrics came from. I was also looking at 1930s photographs of Dublin's street children. The girls in tiny shrunken dresses and the boys in oversized pieces." I love that she referenced Irish horse racing by getting the model's fringes swept to one side, and plaited through at the back. Apparently when done to a horse, this is called a "Connemara Forelock". Above are my favourite looks. 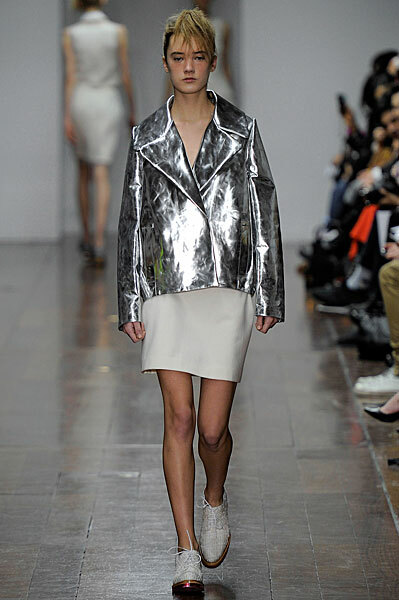 Personal order for the silver jacket, oversized coat and cream shift dress coming up! You'll be seeing a lot more of this 25 year old in the seasons to come.